The 4th of July is right around the corner, and that means it’s time to break out those summer activities! Whether you plan to celebrate on the 4th this year or the weekend before, there are tons of cheap and fun options for making the most out of our independence day. So, without further ado, here are seven cheap and exciting things you can do to celebrate our country this summer! Just because you’re hosting a party doesn’t mean you have to spend a lot of money. Make your 4th of July BBQ a potluck. You provide the backyard and make the burgers and have your friends and family handle the rest! What better way to celebrate than to spend time with those closest to you? 3. Have Your Very Own Picnic! Whether you are bringing a dinner picnic to your local fireworks display or packing a lunch picnic for a nearby festival (see #5! ), picnics are always a great option for celebrating the summer. Pack some sandwiches and maybe even mix up some sangria and hit the road! What summer would be complete without taking part in a festival or two? Luckily, the 4th of July is a prime chance to attend free festivals all over the country. 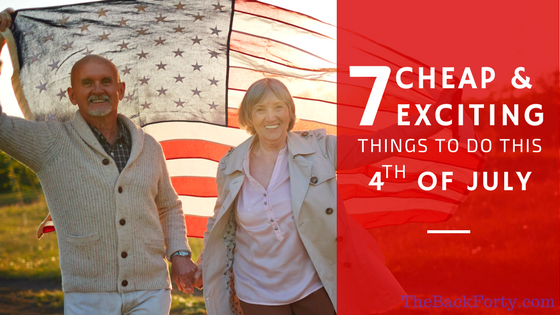 Hop on Google and search for 4th of July celebrations near you, chances are you will find at least a few fun excursions the weekend before this great holiday. The 4th of July is a prime time to get to watch local brass bands, symphonies, and philharmonics for free. See what instrument groups are performing nearby and take a trip to your local bandshell to take in the show (picnics are often a great option for these concerts as well)! Are you reading through all of these choices and just thinking, “eww. I don’t want to deal with all those crowds”? If so, what about hosting your very own Patriotic Movie Marathon in your own wonderfully air-conditioned home? Pick out some of your favorite patriotic movies, pop some red, white, and blue popcorn and settle in for a quiet celebration at home. Stumped on where to begin? Here are some movies to get you started: National Treasure, Saving Private Ryan, Mr. Smith Goes to Washington, Glory, or Capitan America. Regardless of how you choose to spend your 4th of July this year, I hope that you celebrate by enjoying the things that you hold most dear and remember all of those who have fought to keep us free.